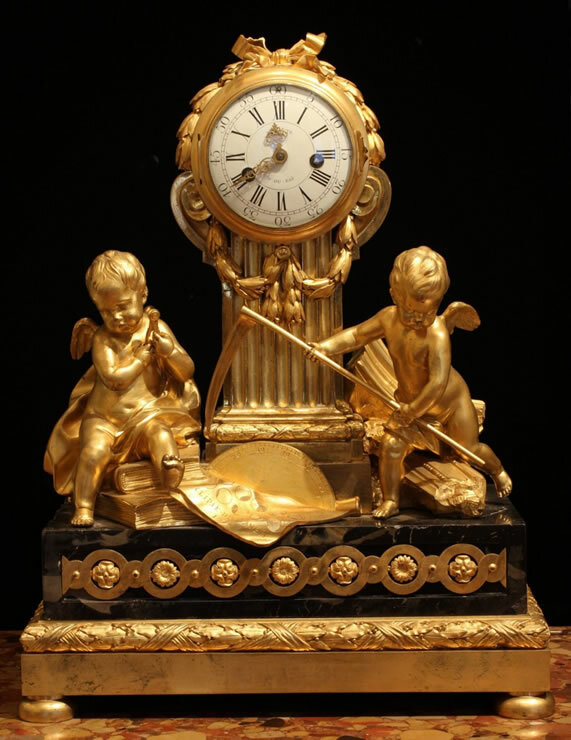 Louis XVI gilt bronze and Portor marble clock commemorating the lunar eclipse of 1764 with movement by Lepaute. The movement, raised on a rectangular fluted column, is flanked by two winged children. One, holding a compass while sitting on a pile of books personifies Astronomy; the other, astride ruins and holding a scythe personifies Time. Between them lies a chart portraying the lunar eclipse of April 1, 1764 and a declination scale. Lepaute was married to one of the most well known astronomers of the time, Nicole-Reine Étable de la Brière. Her observations of the eclipse were widely published and the chart on the clock is thought to be hers. The figures and movement are posed on a stepped Portor marble plinth, decorated with ormoulu moldings, and resting on an ormoulu base. Jean-André Lepaute (1709-1789), one of the greatest clockmakers in France in the 18th century, supplied magnificent clocks for the most important clients in France, often commissioning the best sculptors and bronziers for the cases. The figures on this clock were sculpted by J.-A Houdon. The model is Nº 4 in Lepaute’s Déscription de plusieurs ouvrages d’horlogerie, Paris 1766, where he identifies the sculptor. See: Tardy; Dictionnaire, page 379 for the Lepaute Description. A number of clocks nearly identical to the central columnar portion and signed “Osmond” are known. Robert Osmond was one of the major bronziers who worked for Lepaute. A drawing by Osmond for the columnar clock and several of the signed clocks are illustrated in Vergoldete Bronzen on pages 194-195 of Volume I.